Bridgeport, CT – (March 3, 2017) – Quite a Coup! 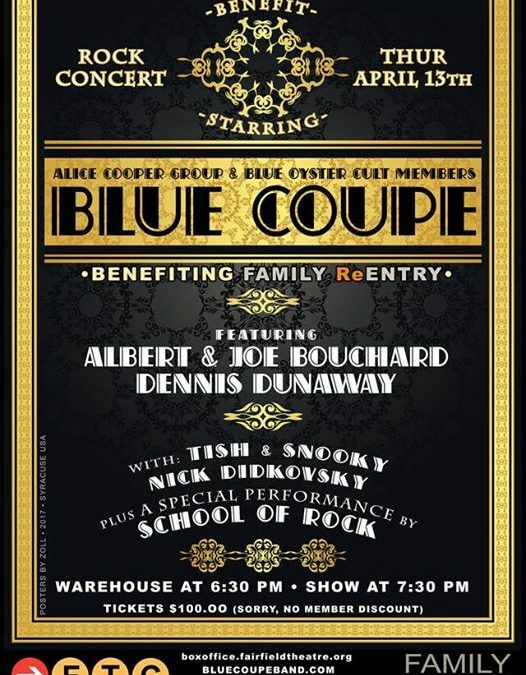 Family ReEntry, a Bridgeport-based nonprofit that assists individuals and families impacted by the criminal justice system, today announced that its Spring Fundraising event will be a benefit concert starring Blue Coupe, a band formed by members of Blue Oyster Cult and the Alice Cooper band. 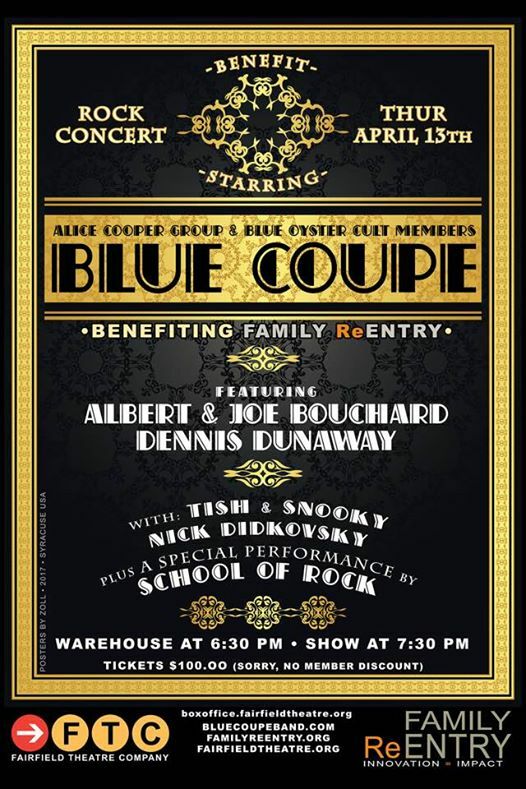 Featuring Rock & Roll Hall of Famer Dennis Dunaway, co-founder of the Alice Cooper band, and Joe & Albert Bouchard from Blue Oyster Cult, Blue Coupe will perform at The Warehouse at Fairfield Theater Company (FTC WAREHOUSE), on Thursday April 13th. The show starts at 6:30 and features a Special Performance Opening Act of teens and tweens from Fairfield’s own School of Rock. Tickets are now on sale through the FTC Box Office for the show. 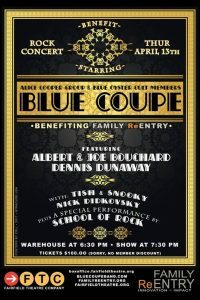 Blue Coupe will perform tracks from their upcoming new album as well as hits from Blue Oyster Cult and the Alice Cooper Band (Don’t Fear the Reaper, Burning for You, Godzilla, School’s Out, Billion Dollar Babies, No More Mr. Nice Guy). With the funds from this event, Family ReEntry will be able to expand its services and continue in its work advocating for justice reform and providing programs that restore dignity and renew families with criminal justice issues. 501c3 nonprofit founded in 1984 as a reentry support group for men at the Isaiah House in Bridgeport. It has since grown to include policy advocacy, and intervention, prevention, in-prison, reentry, fatherhood and youth & family programs. Over the past 33 years, effective advocacy efforts and community-based programs developed by Family ReEntry, have significantly reduced the likelihood that clients will re-offend, be re-arrested, or be re-incarcerated. Its programs provide a spectrum of services designed to disrupt the intergenerational cycle of incarceration. Family ReEntry addresses the specific needs of each client and their families through individualized case management and support services. It works to create a positive social network for each client, helping make their transition from prison back into the community a successful, self-sufficient one, while strengthening their families and the community. Family ReEntry operates its programs in strategic locations that encompass eight municipal regions and judicial geographic areas, two parole districts and five prisons. Approximately, sixty-percent of those served by Family ReEntry are from greater Bridgeport – Connecticut’s largest city. The organization has offices in Bridgeport, Norwalk and New Haven, CT. Programs are also held in Stamford, Waterbury, Derby, New London and Norwich, CT. More information is available at www.familyreentry.org and on its social media sites including, Facebook, Twitter, Pinterest, Instagram and YouTube. entertainers include Rock and Roll Hall of Famer, Dennis Dunaway bassist of the legendary Alice Cooper group, alongside multi-instrumentalist, Joe Bouchard who founded Blue Oyster Cult with his brother Albert Bouchard master of the drums. These revolutionary originals were the heartbeat of several of the best-known songs in the history of rock. And note for note, their full-throttle expertise hits you over the head and grabs you by the heart in Blue Coupe. The band has found continuing glory with their highly-acclaimed album, Tornado on The Tracks, which has multiple Grammy considerations in 2011 and 2012, including “Angel’s Well” featuring Robby Krieger legendary guitarist for The Doors. And Blue Coupe continues to tour North America and Europe with such illustrious shows as the Halloween Parade in New York City where they were seen by more than a million people. 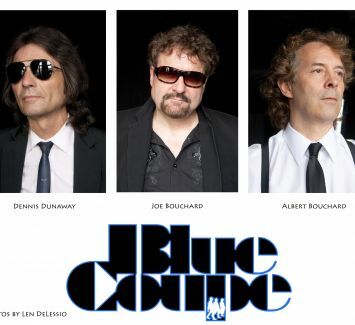 Blue Coupe’s second album, Million Miles More, features Alice Cooper, Tish and Snooky from Manic Panic, Ross the Boss from Manowar and the Dictators, Buck Dharma from Blue Oyster Cult and Goldy McJohn from Steppenwolf as special guest stars. The album was mixed by Jack Douglas (Aerosmith, John Lennon, Cheap Trick, Alice Cooper, BOC) and Warren Huart (Aerosmith, The Fray, James Blunt). The new single “Hallow’s Grave” with vocals by Alice Cooper has been submitted for Grammy consideration.